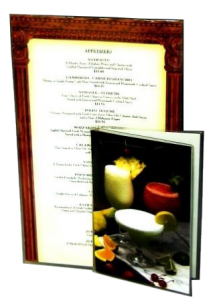 We offer a large selection Casual Dining Menu Covers with clear vinyl pockets to hold your restaurant menu, ideal for family restaurants, bars and Bistros. 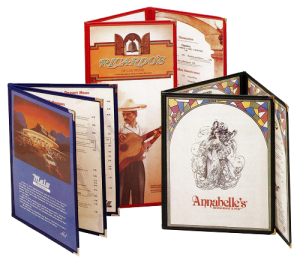 Menu holders come in a variety of color and material choices, with a large selection of options and sizes including custom sizes and design. 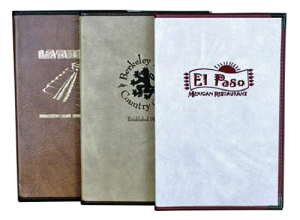 All of our casual dining menu covers for restaurants are made in the USA with quality materials for durability. Custom decoration included and custom sizes available at no extra charge. 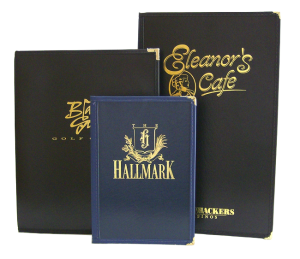 Click on any Casual Dining Menu Cover with Clear Pockets for details and Prices. Flexible covers with clear vinyl panels with sewn binding in leatherette or nylon material and metal corners. 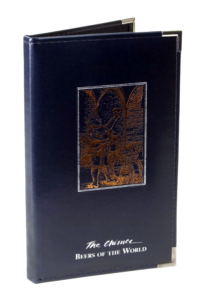 A flexible menu cover with leatherette front and back panels and clear plastic pockets inside sewn with leatherette binding and metal corners. A rigid menu cover with imitation leather outside, clear pockets inside, sewn with leatherette binding and metal corners. 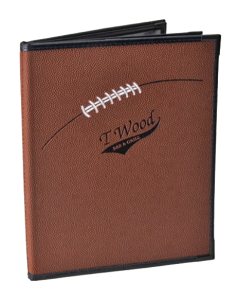 A rigid menu cover with football or basket ball material outside, clear pockets inside, sewn with leatherette binding and metal corners. A rigid menu cover with very durable deep grained faux leather material outside, clear pockets inside, sewn with leatherette binding and metal corners. 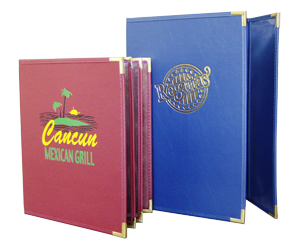 Faux leather material outside sewn over padded binder’s board with clear pockets inside for your restaurant menus and metal corners. Clear heavy gauge vinyl menu covers with no binding.